Wanting to bring back a little of our childhood as my best friend and I were about to celebrate our 20th Halloween, we knew from the start we had to get Disney involved. Of course little girls love dressing up as Disney princesses from a young age but WHO SAYS there’s an age limit when it comes to rocking Aladdin and Little Mermaid Costumes. With my dark red hair and my friends tan complexion we knew we could pull off our characters to a T…. However, there was one problem involved … finding the costume! After endless hours of searching online for outfits that didn’t even look like the movie …. We came up with an idea …. What if we tried to replicate the costumes we use to love watching on our VCR tapes over and over again. We walked into a Joanne’s Fabric and matched the colors of Jasmines gypsy pants and Ariel’s Mermaid tail as close as we could. After that we purchased jewels for Jasmines top and two seashells from Micheal’s for Ariel’s top. For Jasmines costume we cut the fabric in a pant like shape and hand sewed to make loose pants. 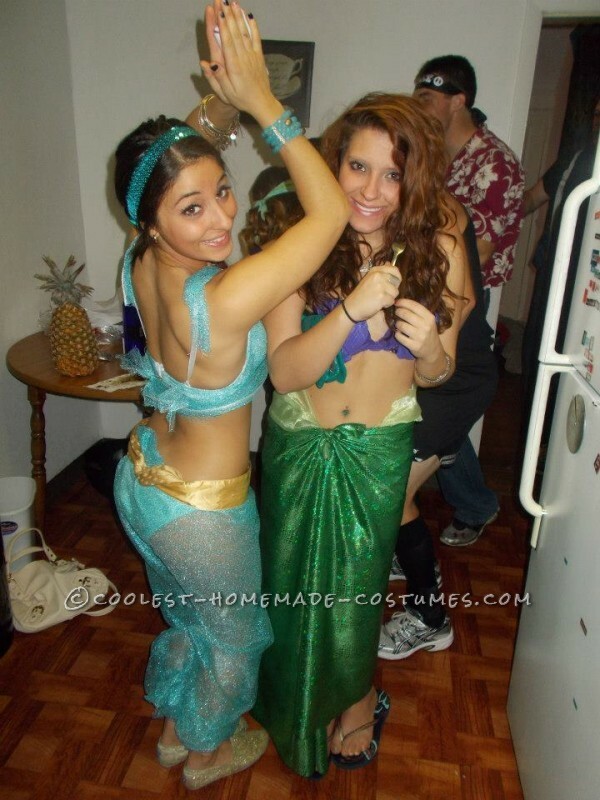 for Ariel’s costume all we had to do was cut a long like maxi skirt and tie at the side! They came out way better then we predicted; and the best part was acting like our characters the whole night !! Between Jasmines belly dancing and “Magic Carpet” riding impersonation combined with Ariel’s hair brushing with a fork and singing “Part of that World” we had the whole parties attention and everyone was reminiscing about their favorite scenes / Disney movies as well! And to our surprise have the fun was making it! We can’t wait to see what Joanne’s Fabric has in store for us this year …..Cinderella and Tinkerbell maybe ;) WE SHALL SEE! – Ariel is known for her long hair, so add extensions or if you have long hair keep it down with loose waves! – Carry a stuff animal of flounder or Sebastian with you. 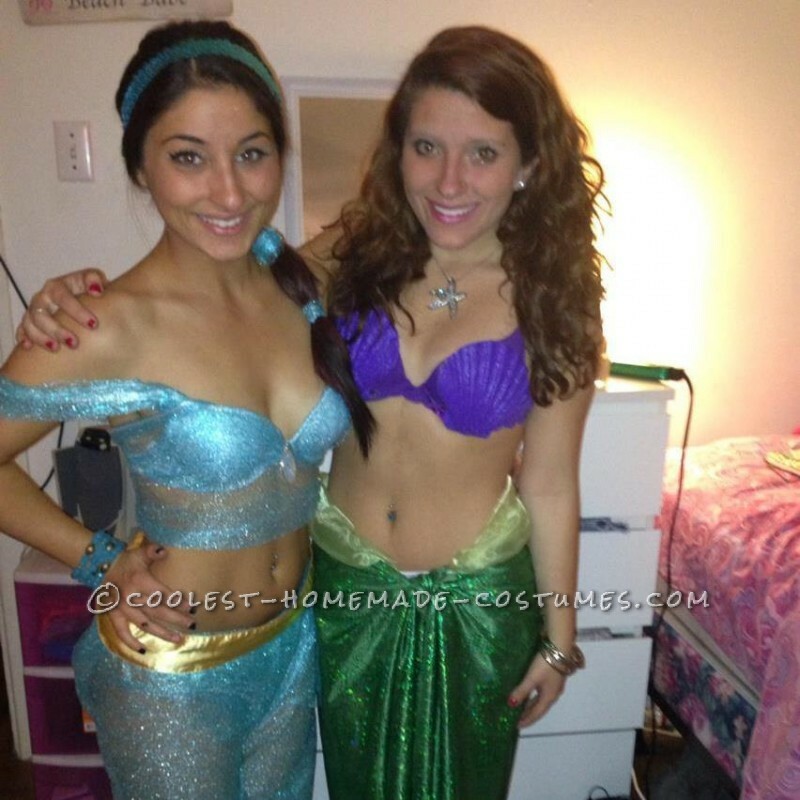 Ariel is rarely seen without her under the sea pals. – She’s got gadgets and gizmos a plenty!!!! So to add to Ariel as a character carry around a vintage fork to brush your hair with or maybe even a big shell to use as a phone. – Add a green boa (to look like seaweed) or maybe shell ear ring or a shell necklace.